Friend car stolen this morning. Any info will be good. 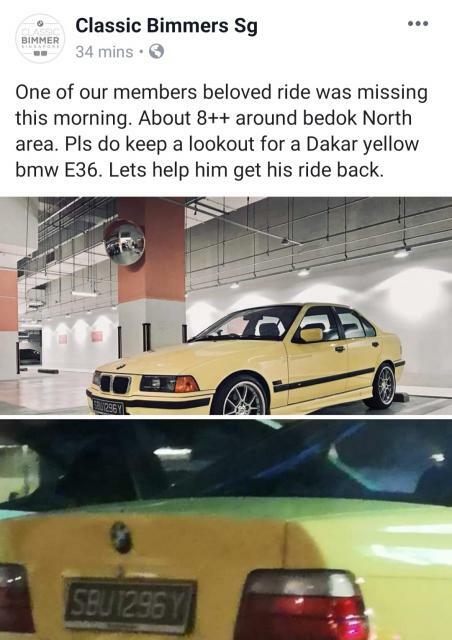 Didnt know ppl still steal cars in SG nowdays. Edited by Mockngbrd, 11 February 2019 - 10:33 AM. should get the taxis/PHVs to help too. Hope it can be found soon. Such rare car should not be ruined. there should surveillance cameras around car park and on the street for police to trace down the car. In Singapore, there are cameras everywhere. If there is a gantry in the carpark, that would be the first clue what time the car has been stolen and leave the cp because most cp gantry, there is a camera however you will need a police report and the police to request for the footage. From there, the police will be able to trace the movement of the car thru the cameras planted along the roads. Car has been found. Dunno anymore details. That car park looks like it’s the one at Bedok Mall. Edited by mersaylee, 11 February 2019 - 05:02 PM. Fastest lost and found thread. That car park looks like itâs the one at Bedok Mall.